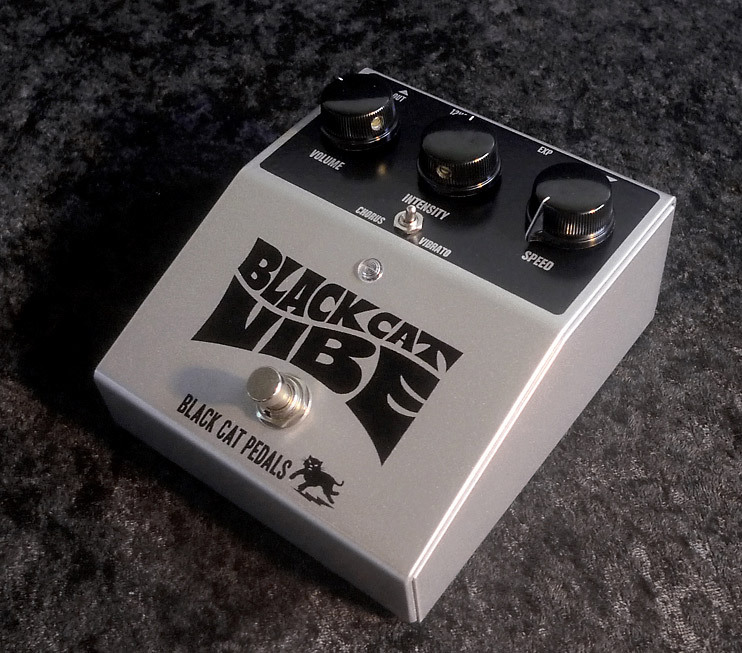 Black Cat Pedals just announced that they are in the process of releasing a new pedal called the Black Cat Vibe. Currently, there is a two month wait for the Black Cat Vibe, but you can get on the Black Cat Vibe waiting list by sending them an email (details further below). As you can hear, it sounds pretty amazing. Thick and rich univibe-esque vibrato! The Black Cat Vibe will retail for $334.95 USD (less than the original). It will also come with an expression pedal jack for speed control. The Black Cat Vibe also uses the flashing internal lamp with photo-resistors (how they did it with the original Univibes). I have personally played a few Black Cat pedals (currently have a mini-trem on my board now) and the build and audio quality is top notch. If you haven’t looked at Black Cat before, they’re definitely worth a look. If you want to get on their wait list, visit their Black Cat Vibe page and click the link to get on. Also, be sure to follow Black Cat on Twitter and Facebook for more information regarding the release of the Black Cat Vibe and other Black Cat news! INSTRUMENT- the bookHeptode Deep Crunch Give Away Reminder!